LC to LJ Torana Bonnet Hinges are machined from 6061 - T6 aluminium and are Australia Made. 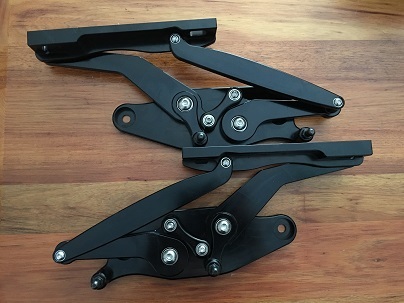 These come anodised black and with the mounting bolts. Free general postage within Australia only. Please note if you have had extensive work in your engine bay and are not sure if hinges will fit your car, call Megan to discuss as we can offer easy solutions to these problems.